“The distinction between doing research ‘with,’ and doing research ‘on’ is really important,” says Ann-Louise Davidson, an associate professor in Concordia’s Department of Education. 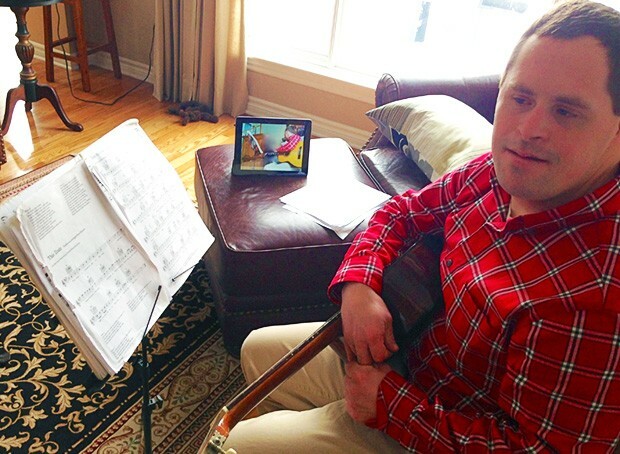 Montreal, February 23, 2016 — About two per cent of Canadians have an intellectual disability (ID). These individuals face substantial challenges — some related to the stigma of their condition, others because of their difficulty with living autonomously. New research from Concordia shows that mobile technologies like tablets and smartphones can go a long way in helping people with ID face these challenges. By using these tools to create videos that explain their life experiences and successes, they can become more self-empowered while demonstrating and teaching their skills to peers. For a study recently published in Social Inclusion, Ann-Louise Davidson, an associate professor in Concordia’s Department of Education, worked with eight individuals with ID to co-create moving personal video testimonials. Using iPads, participants wrote and directed short videos that highlight important aspects of their lives. They then shared rough cuts of the videos with a focus group, receiving feedback as well as praise, prior to uploading the videos to a shared YouTube channel, accessible to the public. Davidson says video production can be extremely empowering, but videos for people with ID are almost never made by them or with them in collaboration. She turned that model on its head by conducting her study with the eight participants as co-researchers, having them produce and edit their own videos. “The distinction between doing research ‘with,’ and doing research ‘on’ is really important,” she says, noting that, according to a study, her research is among only 17 existing projects worldwide that have adopted a collaborative approach with this population, and is the only one of its kind in Canada. Davidson used what’s called the capability approach to help participants make decisions about what aspects to highlight in their videos. Results were encouraging: all participants provided enough information about their capabilities and no one was intimidated by the technology. What’s more, while the capabilities the participants shared fell into various categories — receiving an award, being involved in various organizations, living independently, making art or having a paid job — there was nothing unusual about these capabilities compared to what brings satisfaction to people living in the broader community. “With powerful mobile technologies so readily available and accessible, people with ID can and should produce their own educational resources,” says Davidson. Partners in research: This study was carried out thanks to the support of Concordia and the Petro-Canada Young Innovator Award. Read the cited study by Concordia’s Ann-Louise Davidson.